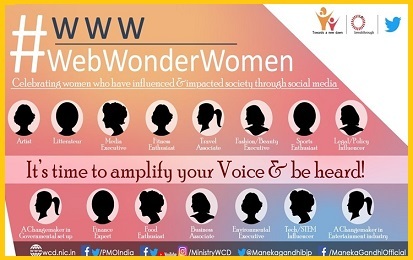 Union Ministry of Women and Child Development, Government of India has launched an online campaign Web- Wonder Women to discover and celebrate the exceptional achievements of women, who have been driving positive agenda of social change via social media. The Web-Wonder Women Campaign is aimed at encouraging, recognizing and acknowledging the efforts of these meritorious Women. The Web-Wonder Women Campaign has been launched by the Ministry of Women and Child Development, Government of India in association with the NGO Breakthrough and Twitter India.